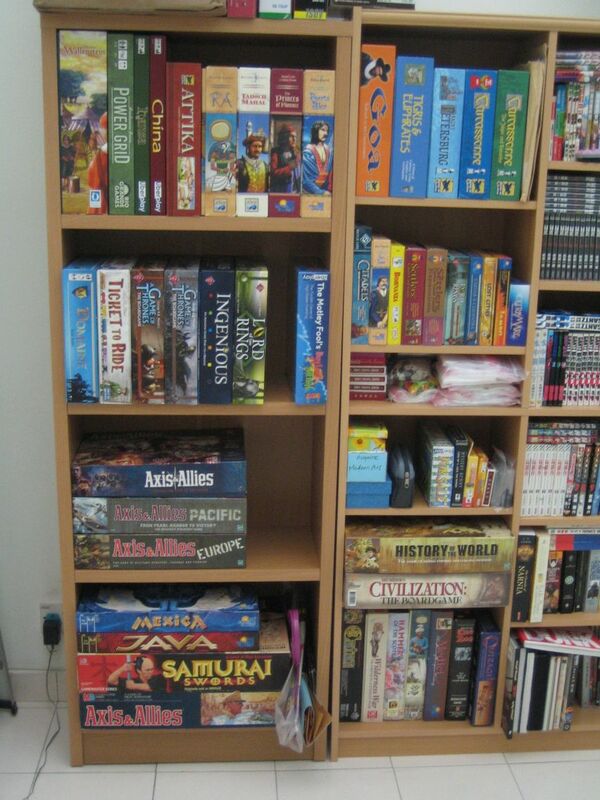 Boardgames, in particular German boardgames (a.k.a. eurogames / designer games / family strategy games), became my big time hobby around end of 2003, when I was working in Taiwan. It is a good activity for spending time with family and friends. Games are usually not too long (most range from 30 mins to 1.5 hours), and it is intellectually challenging. I don't have a regular group of friends who play with me. Some friends play with me now and then, but I only have one more regular gamer friend Han. Usually we play on Saturday afternoons at my place at 2pm. I have created a blog for my boardgame hobby at http://hiewandboardgames.blogspot.com so this boardgame section of my website will not be updated very frequently now. Can't Stop is a simple dice game with a race element (players racing to push their markers to the top of 3 columns) and a push-your-luck element (do you take the risk of rolling the dice again, hoping you get the rolls you need and improve your position, at the risk of losing what you have gained so far?). It is for 2-4 players and plays in maybe 20 minutes. It has some simple decision making, some luck, and the cheers and groans when your gamble pays off or when you fail your roll and waste all the effort spent on your turn. My homemade version of Can't Stop. I use pieces from another game Age of Steam. On 2 Jun 2007 Han invited a new friend along - Shankaran, also a doctor, who is working in KK. I should look him up the next time I'm back in KK. Chee Seng was back in KL from Singapore. I quite like Traumfabrik. It is my favourite among Reiner Knizia's popular auction/bidding games, the others being Ra, Modern Art and Medici (all of which I also own). I guess I just enjoy the theme of movie making. Unfortunately I didn't do well at all in this game. I came in dead last. Although I managed to get some big shot directors, I didn't manage to complete some movies in time. I still don't know what I did wrong. I must have missed an important part of the strategy. Shankaran, Han and Chee Seng, playing with my homemade version of Traumfabrik. I like my version, which used some components downloaded from www.boardgamegeek.com, because the directors / actors / movies are from around 1990's and I'm familiar with them. When we play Ticket To Ride, we tend to hide our eyes with our hands (like making a cap) when we examine the board, so that others cannot follow our eyes and guess which cities we are trying to connect. This practice started when we were playing with our friends in Taiwan. Iliad, Roma, Castle, Mystery Rummy Case #3 Jekyll & Hyde, Beowulf, Taluva, Die Macher, Lord of the Rings: Battlefields expansion, and LOTR: Sauron expansion. Most of my games are ordered from online retailers in USA. Their prices are much cheaper than the recommended retail prices. Although shipping costs is high, the games still end up being cheaper than if I bought them from a Malaysian seller (whether online or game shop). Also some games are not available in Malaysia at all. 23 Jun 2007. The latest batch order of Han and I, from www.timewellspent.org. It took more than 2 months to arrive (surface mail). Unfortunately this time the games were held by customs and were taxed a not insignificant amount. Eight investigators are hunting down Jack the Ripper, but one of them is the real Jack the Ripper. In this 2-player game which lasts 8 turns, one player plays Jack, trying not to be caught or to escape the scene, and the other player tries to first identify and then capture Jack, with only one chance to make a correct accusation (wrong accusation = Jack wins). Han and I played twice, switching sides, and Jack was caught twice. It's hard to play as Jack. Maybe it takes more experience to play Jack well. My Jack was already identified by end of Turn 2. Interesting side note: Who would have known - Sherlock Holmes may be Jack the Ripper! Sometimes when Michelle is not lacking sleep, and the girls are behaving (or sleeping), she joins us to play. Siti can help to take care of Chen Rui unless she needs to be breastfed or insists on Michelle taking care of her. Shee Yun usually can play by herself. My other not-so-regular boardgame kaki's have become quite-rare boardgame kaki's now. Michelle was my main kaki when I first got into German boardgames, when we were in Taiwan. The games were non war related and are not long like the previous games I used to play (Axis & Allies series, Samurai Swords etc). We visited Witch House (a boardgame cafe very near National Taiwan University) often (on weekends) and spend the afternoon there trying various boardgames. I'd look up the rules and made rule summaries so that when we get there we can help ourselves without asking the staff to teach us. Louis 14 is a game about players vying to influence important people in King Louis XIV's court - his mum, his wife, his ministers, his mistresses etc. Successfully influencing them gives rewards. These people behave differently and give different rewards. Some of them will reward you as long as you pay them a certain amount of money, even if you have only talked to them once. Some will reward you as long as you spend enough time befriending them. Some of them only give the reward to their closest friend (among the players). As players have limited time and energy and money, they need to pick where to compete with others and where to let go. The player who best utilises his/her influence will win the game. This game is the DSP (German Game Award) winner of (I think) 2005. It is considered medium/high complexity (for German games). I have only played it once (3 players) and I like it. Some areas are more hotly contested than others. On 30 Jun 2007, Han and I had a morning gaming session, from about 7am to 12pm. We played one long game of Britannia (about 3.5 hours) and then Michelle joined us for a game of Beowulf (one of my new arrivals, and a first time play for all of us). Britannia is a game covering about 1000 years of history in Britain, from 43AD to 1066AD. 17 nations or tribes or peoples appear and fade away throughout the game. In the foreground are the nation cards of the tribes controlled by me. These nation cards show all special rules that apply to the tribes, and how these tribes score points, e.g. conquering an area, holding an area, killing certain types of units or killing certain leaders. The timeline bar in the middle of the photo shows the special events occuring throughout the 16 rounds of the game, e.g. the appearance of certain tribes like the Norsemen or Danish or leaders like King Arthur. Britannia is designed to be a four-player game, each controlling 1 colour, and the multiple nations/tribes of that colour. In our game I played controlling green (since I'm always green) & blue, and Han red & yellow. Britannia is very much a game about recreating history and experiencing history. The objectives of each tribe encourage players to make decisions that are historically logical. There is much historical flavour in the game, and to me, this is the most fun part of the game. Winning or losing in the end is less of a focus. Well, maybe I say this because my two colours came in last. Romans (yellow) are strong at the start of the game. They can build forts. Destroyed forts are flipped over, to show the burning fort side. Many other "barbarian" tribes get points for destroying Roman forts. Among my new games I have played Mystery Rummy Case #3 Jekyll & Hyde, Beowulf, and Lord of the Rings: Battlefields expansion. Yet to be played are Taluva, Lord of the Rings: Sauron expansion and Die Macher (a complex, long, 4-hour game about German elections). No photos taken of these new games I've played though. I own two other games in the Mystery Rummy series, MR1 Jack the Ripper and MR4 Al Capone and the Chicago Underworld. Jekyll & Hyde is about the same complexity as Al Capone. One of the unique things about Jekyll & Hyde is there is one Dual Identity Card which will either be showing the Dr Jekyll side or the Mr Hyde side, and at any one time, only melds of the respective character (J or H) can be played. Jekyll & Hyde is enjoyable, and different from the other two. My favourite is still Jack the Ripper, but I like this one too. Michelle and I have played Jack the Ripper about 200 times now. Look at all those Roman forts being attacked by the Saxons (red). Beowulf is a game of planning, of daring (a.k.a. playing a game of chicken), of reading your opponents and of knowing when to press on and when to concede. The game progresses through a series of auctions and other events. Players gain cards, and use them to win auctions. The auctions are not auctions in the traditional sense. In these auctions, every player will get a different reward or penalty. Players spend their cards trying to get the best rewards, or to avoid the penalties. Cards committed cannot be taken back, because you will always "win" something. This is unlike traditional auctions where only the top bidder pays the price for the reward. Thus in this game you need to know when to conserve your resources (cards) and when to spend them. The progress of events is fixed, so you can definitely plan ahead. This is a game where you need to pay attention to what your opponents want in order to do well. I did very badly, finishing with 17 points to Han's 34 and Michelle's 31. I kept choosing to fight in auctions when either Han or Michelle had more resources than me and also wanted to fight for the top prize. As a result I spent a lot of resources, but did not get many good rewards. I need to try this again. This is Round 7, and the Romans have left Britain. Look at that void in England. Now it's the Angles (blue) and Saxons (red) fighting over England. Lord of the Rings: Battlefields adds an additional "battlefield" element to the Lord of the Rings boardgame, which I like a lot. These "battlefields" look like flowcharts. Actually, I should say they ARE flowcharts. Enemies will appear on the battlefields and can cause bad things to happen to the hobbits. So the hobbits need to spend resources to get the other members of the fellowship - Gandalf, Aragorn, Legolas, Gimli and Boromir - to stop or slow down or kill the enemies. Michelle and I lost our first game of this. We did make it to Mordor, the last scenario board. This felt slightly easier than the Friends & Foes expansion, at least to me. We quite enjoyed this. This is the border between England and Scotland. The Scots (yellow) are doing well. Ticket To Ride is one of Michelle's favourite games. It is a simple game to learn and is suitable for players new to boardgames. Many new players that I taught this game to enjoyed it. The original Ticket To Ride won the Spiel des Jahres, the prestigious Game of the Year award in Germany, in 2004. Ticket To Ride Marklin is the 3rd game in the Ticket To Ride series, the 2nd one being Ticket To Ride Europe. I own all three of them. The basic gameplay of the Ticket To Ride games is you collect cards of different colours, and use these cards to claim routes on the map, and you use these routes to connect cities specified in the ticket cards that you draw. Each ticket card has two cities. You score points by connecting cities and also by claiming routes. The excitement of the game comes from racing to claim routes before the ones that you need are claimed by others, and you are forced to plan a different path to connect your cities. It is a game of brinkmanship where players want to collect many cards because more cards means more options, but at the same time they want to move fast to claim the routes they need before they are claimed by their opponents. It can also be a nasty game of intentionally claiming routes you know (or guess) that your opponent needs. Ticket To Ride: Marklin has a map of Germany, as opposed to maps of USA and Europe in the previous two games in the serie. Ticket To Ride: Marklin adds some complexity to the game, similar to what Ticket To Ride Europe did. One of the biggest and most interesting addition is the passengers. There are little stacks of numbered tokens (representing victory points) in every city, and up to three times during the game, you can use your passenger to "make a trip", collecting the topmost remaining token from each city he/she travels to. This adds another brinkmanship / race element, because you want to wait till more routes are laid out so that your passenger can visit more cities, but you are also nervous whether your opponents will collect those juicy high value tokens before you can do so. The train cards are very beautiful. Each and every one is a different photo. Marklin is the name of a model train company which is the world leader in this hobby. Michelle and I played Ticket To Ride Marklin 6 times, and we both quite enjoyed it. There was some nasty blocking, although not intentional, especially on the middle western side of the board where there are many cities close together, i.e. where the routes are short and easy to claim, and there are many goods tokens making the area look very lucrative. The gameboard takes a bit more time to set up because of these goods tokens on the cities. In the past few months I have been playing much less boardgames. My main kaki Han had exams in mid May and had to focus on preparing for them. And Michelle seldom had energy for boardgames because she needed to wake up a few times every night to feed Chen Rui. But things should start to pick up again now that Han's exams are over. We had a session on 27 May 2007, and it was good to have a session again. I actually felt hungry after the session, probably because of energy used for thinking and strategising. I felt good after that, and was in a good mood the next day at work although work had been tough and there were many issues. I was very stressed out and worn out the previous week, but having had a boardgame session on the weekend really helped me unwind. The purple trains and passengers (yes I know they don't look quite purple in this photo). In TTR Marklin a different colour scheme is used for the player pieces. Instead of red, green, blue, yellow, black, the player colours are red, yellow, black, purple, white. No green (my colour). Dreamblade is a 2-player game played on a 5x5 grid. 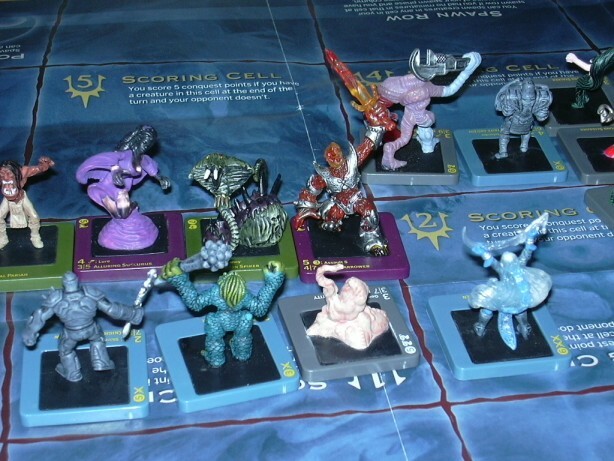 Each turn players bring new characters / creatures onto the board, and can either move, or attack. There are spaces on the board that give points, and killing an enemy character also gives points. At the end of each round the player with the higher points total advances one step on the victory track. First to reach Step 6 wins. The key attraction of this game is the very wide variety of characters. Each of them has different characteristics and many of them have special powers. So the game is very much about constructing your team, and knowing and using your characters' powers. The characters are also grouped into different "races", with each race being strong / weak in different aspects. That joker on the bottom right was trying to scare his enemy into submission. The big pink guy is a car mechanic from Kepong and soundly whacked him with his spanner. Unfortunately for me, I did very poorly at this game. Probably because I couldn't really get into the theme (fantasy with a bit of sci-fi feel), and I was just too lazy to learn up the various character powers, and to learn up how to use them optimally. One thing is for sure - the characters are very colourful and unique. Very colourful and creative characters. Battlelore is the fourth game in game designer Richard Borg's commands and colours series, the earlier games being Battle Cry (published by Avalon Hill), Memoir 44 (Days of Wonder), and Commands & Colours Ancients (GMT). Battlelore is also published by Days of Wonder, the publisher of Ticket To Ride, well-known for beautiful and high quality game components. Days of Wonder has planned many expansions and enhancements to the Battlelore game system. Look at this rabble of jokers (Han's men - he played the English). They can't even agree on where to shoot. How are they going to win any battle? Battlelore, like its predecessors, is a light wargame for 2-players. The basics of the game go like this. The board is split into 3 sections - left flank, right flank and centre. You get a number of cards which allow you to activate units from one or more sections of the board, or to do some special actions. Your activated units can move and/or attack. Dice (with special symbols) determine the outcome of your attacks. To win, you need to eliminate a number (usually 6) of your opponent's units. Each unit has 3 or 4 soldiers, depending on whether they are archers, infantry or cavalry. There are other elements of the game like Lore (magic power), different abilities of different types of troops, terrain effects, monsters, etc. This serie of games has high rankings on www.boardgamegeek.com. I have played Memoir 44 before. I found that to be just OK and had no urge to buy it. Battlelore is a bit more complex so the additional elements and changes probably reduces the impact of luck (in the cards you draw and dice you roll). However, after playing it (just once though), I don't think I'll be buying it either, or Commands & Colours Ancients (which I have also considered buying). I guess the command and colours system just isn't quite my cup of tea. Probably because I feel like I do not have enough control over my troops. I am at the mercy of the cards that I draw. The battlefield at day break. So far this year the game that I have played the most is Gulo Gulo. This is a children's game that I bought to play with Shee Yun, and I have been playing this with her a lot. She sometimes even requests for it, saying "Guno" (gu3 no2 - roughly like �S*c). We don't play with the full rules. I use a simplified version. The object of the game is to advance along a track, to save the little Gulo at the end of the track. To advance, the player needs to steal an egg from the nest, without triggering the egg alarm (a stick stuck among the eggs, which can easily fall down when eggs are removed from the nest). Shee Yun doesn't know the concept of winning or losing. She's happy as long as someone reaches the little Gulo at the end of the track. Oh and she has broken the egg alarm and I had to use sticky tape to fix it. Archers, infantry and cavalry across the river. Guess what the end score was. Han (English) 6, me (French) 0. Zero. Nil. Kosong. ��. So much for disciplined army. Trias is an interesting game. Many billions of years ago, there was only one big land mass on earth, and dinosaurs roamed the land. Gradually the pangaea split into various continents, and players try to ensure their dinosaurs dominate these continents. The game ends when the meteor strikes. In each player's turn, there is a continental shift (sometimes forming new continents, or sometimes even joining two separate continents), and players can have their dinosaurs breed, migrate, or scramble back onto dry land if the land they were standing on was "continental shifted" away. Han contemplating his next move. I have only played this twice. I think there are many more tactics and tricks to explore and try. The game is about trying to split the continents in such a way that your dinosaurs can dominate the larger continents. You try to hassle your opponents by literally pulling the tile from under them, by shifting tiles away from "their" continents, by fully populating a tile (there is a max number of dinosaurs that can occupy any tile) and thus preventing them from migrating / breeding. I think this is a fast and clever game, but there is still much to explore before I can form a more solid opinion. I have ordered a batch of games in mid April and they should be arriving soon. I am looking forward to Die Macher, Lord of the Rings Sauron expansion, Lord of the Rings Battlefields expansion, Taluva, Beowulf and Mystery Rummy #3 Jekyll & Hyde. Close-up of the dinosaurs. The volcano is the south pole. I played yellow because there were no green dinosaurs in the game.